It's hard to be excited about a lowly Android phone on Verizon, considering that Big Red's lineup consists of handsets such as the Motorola DROID X, and the Samsung Fascinate. Still, not everybody is in need of all their features - sometimes you just want Android... for less. For these first timers, who are not seduced by the marketing campaigns to part with their cash for the flagship handsets above, there is the LG Optimus One, aka LG Vortex. Pictures of it had surfaced again, specs are more or less confirmed to be non-thrilling, and there is no FM radio on board. Still, the person that has used the device, admits that Froyo is running smooth as silk on the 600MHz chipset. Verizon, of course, has plastered Bing as the default search engine all over the LG Vortex. The five year search deal between Big Red and Microsoft will be ending 2014, so we'd better get used to this arrangement, since Verizon is being paid top dollar to roll it out. Do I want a crappy slow phone with a small screen or the droid x in which I would be paying the same amount for each month? you get all the android features.. with regards to what the $30 data plan would encompass use for. 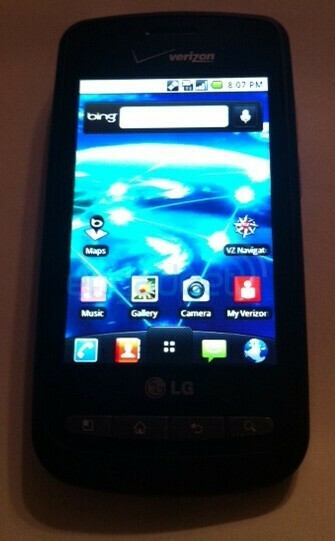 i have a droid x and would also love to get hold of something like this as well. i like the bing search engine. google is a big huge spoiled company. but at the end of the day, a search engine is a search engine. plain and simple. the only thing that worries me is the thought of big red coming out with their own market place in place of the current android market. terrible move.